Richard Sullivan said flames flickering in the fireplace he plans to install in his new Central Avenue hamburger restaurant will be visible to people walking downtown when he opens R.F. O’Sullivan’s later this year. With mahogany exterior walls, a stone wall interior and sirloin burgers, Sullivan is branching out from his Somerville pub, R.F. O’Sullivan’s and Son, to become the newest addition on Lynn’s downtown restaurant landscape. He will ask the License Commission today for an all-alcohol license and he hopes to open for business in December with 20 employees. “I saw an opportunity in Lynn. I think it’s going to be a happening place. The city is changing — especially the restaurant business,” Sullivan said. On its website, O’Sullivan’s boasts about grilling any kind of burger a customer can imagine — with one minor warning — each burger takes about 20 minutes to cook. 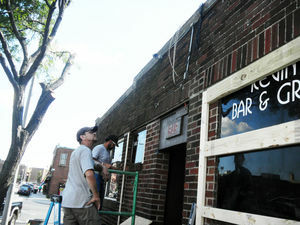 Workers are already renovating the former Kevin’s at the corner of Sutton Street and Central Avenue, but Sullivan said work in preparation for R.F. O’Sullivan’s opening is taking a little longer than expected. City Economic Development and Industrial Corporation Director James Cowdell said the wait for R.F. O’Sullivan’s opening is worth it. “The addition of R.F. O’Sullivan’s to this section of downtown will be great. This area two years ago had three empty buildings that today are now being occupied by Rossetti’s, D’Amici’s and, now, R.F. O’Sullivan’s. We can’t wait for the new restaurant to open and to try one of their famous meals,” Cowdell said. Sullivan described the atmosphere he is planning for his new restaurant as “homey” and said he is excited to add another business downtown. “I can’t believe how supportive the city has been in this process,” he said. Cowdell said EDIC has invested $600,000 into helping Rossetti’s and D’Amici’s launch and helping more established businesses, including Blue Ox and Tatiana’s, prosper.